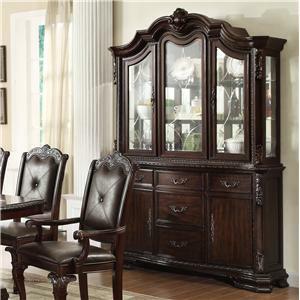 This fantastic china cabinet features two tall, arched glass doors and two long shelves. 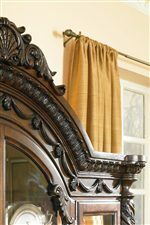 The gorgeous arched top is detailed with ornate carvings and intricate half turned posts. The lower buffet table has three drawers and three doors. 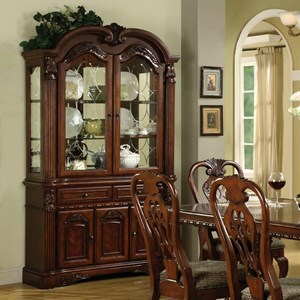 This attractive and grandiose china cabinet is the perfect addition to any fine dining room. The North Shore China Cabinet with Glass Doors by Millennium at Casa Leaders Inc. in the Wilmington, Long Beach, Torrance, Lakewood, Los Angeles area. Product availability may vary. Contact us for the most current availability on this product. Storage Door opening (3) 18.25" x 13.75" x 19.88" Side adjustable shelf (2) 20.56" x 13.75" x 0.75" Center adjustable shelf 18.19" x 13.69" x 0.75" Center drawer interior (lined) 17.06" x 12.50" x 2.50" Side drawer interior (lined) (2) 17.06" x 12.50" x 2.81"
The North Shore collection is a great option if you are looking for Traditional furniture in the Wilmington, Long Beach, Torrance, Lakewood, Los Angeles area. 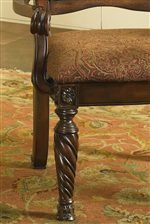 Browse other items in the North Shore collection from Casa Leaders Inc. in the Wilmington, Long Beach, Torrance, Lakewood, Los Angeles area.